THIS SECTION IS DAILY UPDATED WITH NEW CALIBRATIONS DEVELOPED BY POLINI’S TECHNICIANS TO KEEP YOU CONSTANTLY INFORMED ABOUT NEW DEVELOPMENTS OF THE POLINI CP CARBURETOR. If the carburetor is fitted on racing engines that exceed 12000 rpm, please carefully read the following instructions. The Polini CP carburetor is lighter than other carburetors available on the market and under certain conditions it may cause fuel emulsion problems. Air bubbles are sucked into the main jet casing very serious problems to the engine that becomes poor despite having a big or correct jet; the engine begins to detonate up to its break. Available in a wide range of diameters 15/17,5/19/21/23/24, it is entirely made of aluminium, it has compact dimensions and it is 40% lighter than a traditional carburetor. 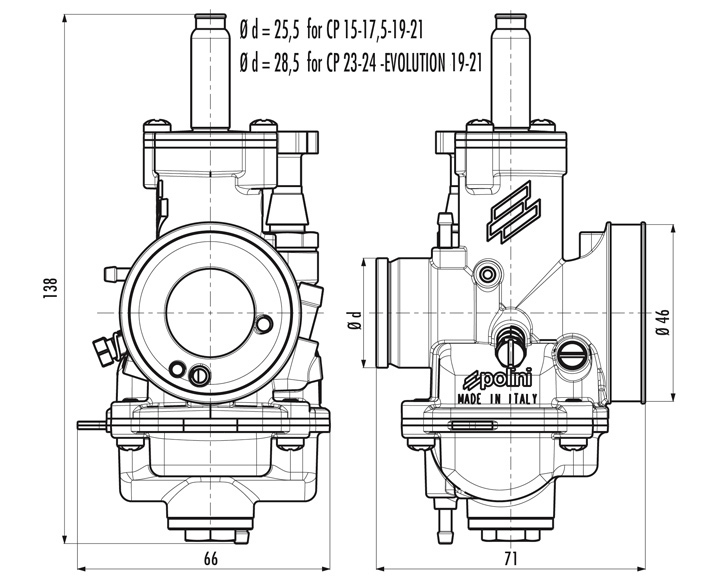 First of all check the assembly instructions in the “Calibrations section” to ensure that the Polini CP carburetor has been tested on your bike or scooter model by the Polini technicians and follow the instructions. Fit the transparent bowl (cod.343.0029) that will allow you to detect the problem and, if necessary, soften the rubber manifold until the problem disappears. If the problem persists, increase the mass of the carburetor mounting the filter coupling iron flanges (cod.343.0028) produced by POLINI. Once the problem has been solved fit the standard bowl again. To ensure an easy and precise assembly on the best sellers engines and its compatibility to different filter boxes, both originals and racing, flanges with different diameters are available. A prestigious project like this has required a deep synergy of competences in this field. An extraordinary teamwork between the technical and the racing department to reach the goal which is visible to everybody: a technologically advanced product and of absolute reliability.